If you don't count commercial vehicles, Lexus should become the top-selling U.S. luxury brand for the 11th straight year. The U.S. auto industry has faced wrenching changes since 2000, when light-vehicle sales peaked at 17.4 million. But Lexus' lead in luxury has remained a constant. In 2010, for the 11th straight year, Lexus should retain the crown as the best-selling U.S. luxury brand in America, a top executive predicted. "If you are talking luxury cars and SUVs, Lexus will repeat," said Brian Smith, vice president of sales and dealer development. "If you include commercial vehicles, then the race will be a bit closer." Currently, Lexus leads Mercedes-Benz and BMW passenger vehicles by about 5,000 vehicles, according to the Automotive News Data Center. But if sales of Mercedes' Sprinter vans are included, Mercedes has a 1,700-unit lead over Lexus. 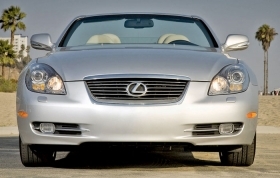 Lexus has been the luxury sales leader since 2000, according to Automotive News' calculations.